With a turnover exceeding 91 million Euros, the Franz Morat Group has beaten once more its record of the previous year. The Group managed to almost double its turnover since 2010. For 2019, Manager Gökhan Balkis forecasts a further turnover increase: already in the coming year, the Group will aim at the next major milestone of its history with a budgeted figure of 100 million Euros. The main growth drivers are in particular the electromobility, automotive, intralogistics and rehabilitation technology markets, where the Franz Morat Group has continuously strengthened its presence in the last years with innovative drive solutions and high-volume orders. This led to record incoming orders (12% above target) and orders on hand. Also the international production sites strongly contribute to the growth. The injection moulding facility F. Morat México in the Mexican automotive belt in Lerma is already writing black figures, after barely a year of operational activity. The assembly facility Framo Morat Polska in Nowa Ruda, which started production in 2015, contributes to the lasting productivity increase and provides important capacities for the whole corporate group. A further production facility is being built in immediate proximity, for the manufacture of electromobility drive solutions. The joint venture Morat Swoboda Motion founded at the beginning of the year with the renowned automotive supplier Swoboda has, in its first extension stage, a production surface of approximately 4,500 m². The first machines are currently being commissioned in Nowa Ruda, series production will start already in June 2019 with about 40 employees. 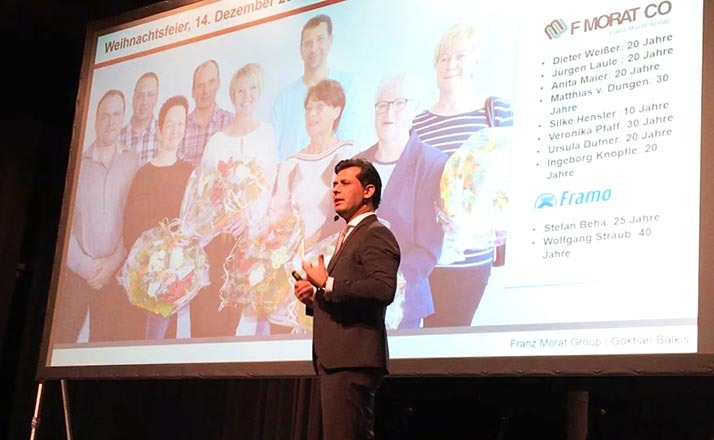 The Franz Morat Group is employing today 665 people in total. 82 new employees have been hired in 2018 alone. In order to be prepared for the targets and challenges of the coming years, the personnel will be increased already next year to more then 700 employees.